Feel more secure in your home with durable entry doors offered by the professionals at Clear Choice Home Improvements. Our front doors will instantly enhance the aesthetic appeal of your home by providing a warm and welcoming entrance for all visitors. We are based out of Manchester, New Hampshire, but our reach stretches through all of New Hampshire, southern Maine, northern Massachusetts, and southern Vermont. In order to provide you with the best products in the industry, we have chosen to offer custom front doors straight from the industry leaders at ProVia. The entry doors we provide to homeowners are made in four unique styles of durable fiberglass and steel so that you have access to the sturdiest and most customizable products in the industry. In fact, you will be able to find a perfect match for your home by selecting from a wide array of woodgrains, finishes, and styles. The wide reach of Clear Choice Home Improvements allows us to help countless homeowners with the products they desire to improve their daily lives. And, as a family-owned and -operated company we continually operate our business with the same hands-on and individualized service you would expect from a small business. Our highly-qualified installers are able to professionally handle your project because they are experienced in all aspects of the industry. What’s more, we feel so strongly about their work that we back it up with a lifetime warranty. 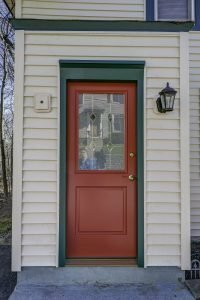 For more information about the entry doors we offer to residents of New Hampshire, southern Vermont, northern Massachusetts, and southern Maine, contact Clear Choice Home Improvements today. When you do, one of our knowledgeable team members will happily answer any questions you may have about our products and services.